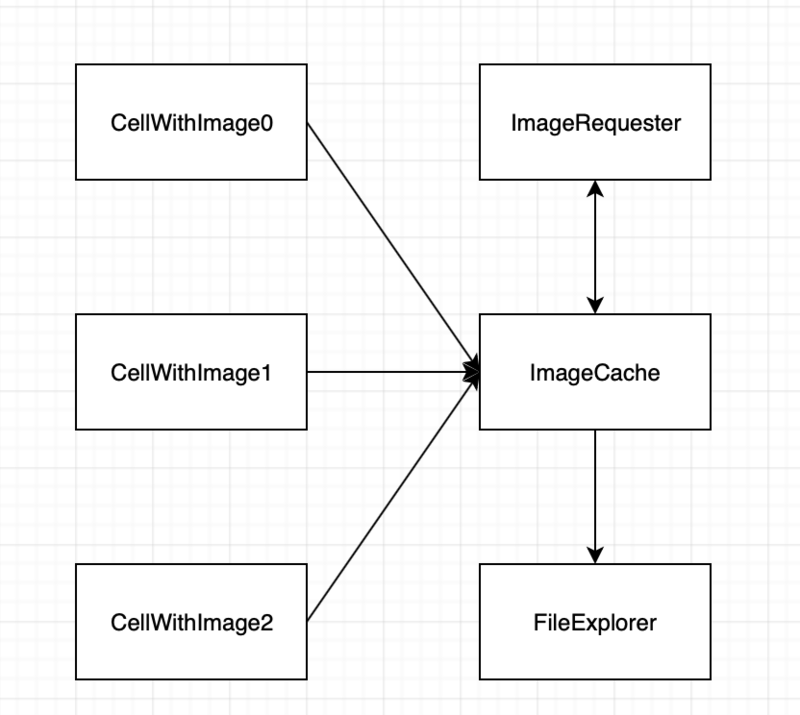 CellWithImageX: Subclasses of UITableViewCell. They have an image and an loading indicator. Only 1 can be shown at the time. ImageRequester: Downloads the images and gives ImageCache a callback when it's done. public weak var obj: T? // I can not understand how it can work if it isn't a singleton. // From every cell, I can easily pass the reference without to much hassle. // I am not sure for an singleton alternative. // TODO: Maybe remove some elements from time to time? // Bit concenered about a race condition. // decide what would be the best way. // LoadableImage has an identifier which we can use to later on match the downloaded image. FileExplorer.sharedInstance.save(image: image.pngData()!, photoIdentifier: forPhotoIdentifier) // This is validated that this works, we can safely force unwrap. // While iterating it may occur that the reference is gone. In my cellForRowAt method in my tableView, I am calling the ImageCache handleImage method on my cell.loadableImage property. I am using a few singletons: ImageRequester, ImageCache and FileExplorer. I am not sure if this is the best approach, but I can not imagine a better way because this way, all my cells can easily register themselfs. I have a array of weak objects which references to the loadable images inside of a tableViewCell. Isn't there a better way? I am asserting I am on the main thread. If I am on multiple threads, race conditions may occur while I loop through the array. I looked into DispatchQueues and Semaphores. I just didn't found the right way to do it, and what the best way would be in my case. Does someone has a suggestion about what way would be a good way in my case? Browse other questions tagged image swift or ask your own question.